Niger is a country of contrasts – a country that offers an incomparable diversity, in which desert areas are countered by fertile valleys. Niger is a meeting ground for various populations living there. Over centuries, they have taken advantage of their differences in order to exploit the limited natural resources in the best way. The people of Niger are rich, rich in pride, culture and traditions, rich in their ability to survive together the periodic challenges to which nature exposes them. But, Niger is also a country in the process of transformation. Niger is traditionally an agricultural and pastoral country. In recent decades, cities have grown, especially Niamey. This new urban population thus constitutes the basis of the evolution of society. Since the nineties, the population has been fully involved in the democratization process. During the last 10 to 20 years, the security issues have significantly harmed the tourism industry in Sahel and the investments in this sector. Thanks to the positive development of the stability in Niger, it is increasingly possible to visit the cultural wonders that Niger offers. Humans have lived in what is now Niger from the earliest times. About 60,000 years ago, humans inhabited what has since become the Sahara Desert of northern Niger. As the Sahara dried after 2000 BC, the north of Niger became the desert it is today, with settlements, trade routes and most people living along what is now the southern border with Nigeria and the southwest of the country. Over the centuries, several empires have ruled over the actual territory of Niger. 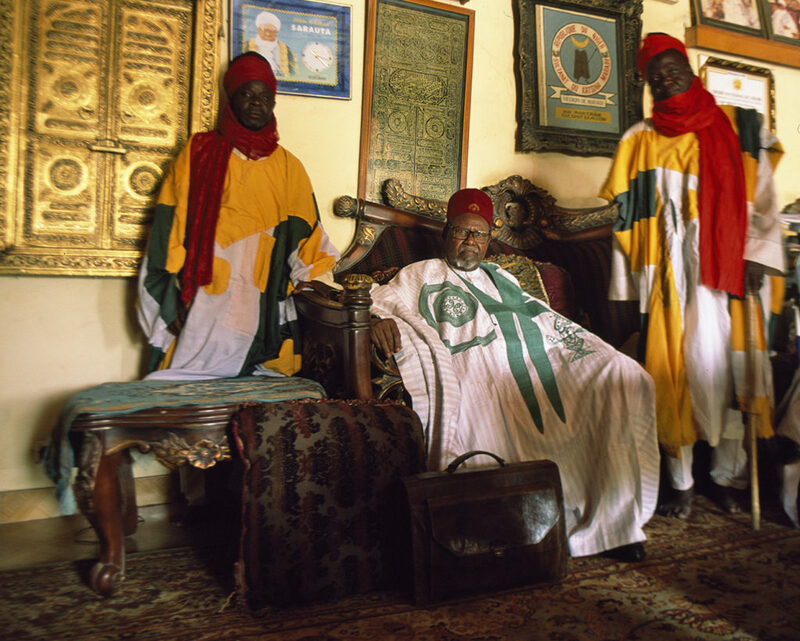 The Hausa states of Kébi, Katsina and Daoura have been established since the 12th century and covers the central-southern part of Niger. The eastern part of Niger was under the control of the Empire of the Kanem, which was later succeeded by the Bornu Empire. During the 16th century, the western part of the country was part of the Songhaï Empire whose masters originated in the Adrar and the Iforas. Many other important migrations have taken place: the Tuaregs who settled in Air in the 11th century; the Fulani who founded two great empires in West Africa in the 19th century as that of Ousmane Dan Fodio who founded the Sokoto Caliphate (Northern Nigeria). Niger experienced Arab influence through trans-Sahara trade and Islamic influence with the penetration of Islam. More recently, the colonial occupation has brought European influence as well as the country’s current borders. History has thus entrusted Niger with a heritage that today represents a tremendous cultural asset. Until the colonial period, Niamey was a small village but, from 1902, the French established a colonial post there. In 1926 the colonial administration was transferred from Zinder, and Niamey became the capital of Niger. The population gradually increased at the rate of droughts and migrations, from about 3,000 in 1930 to around 30,000 in 1960 up to the present 1.3 million inhabitants. 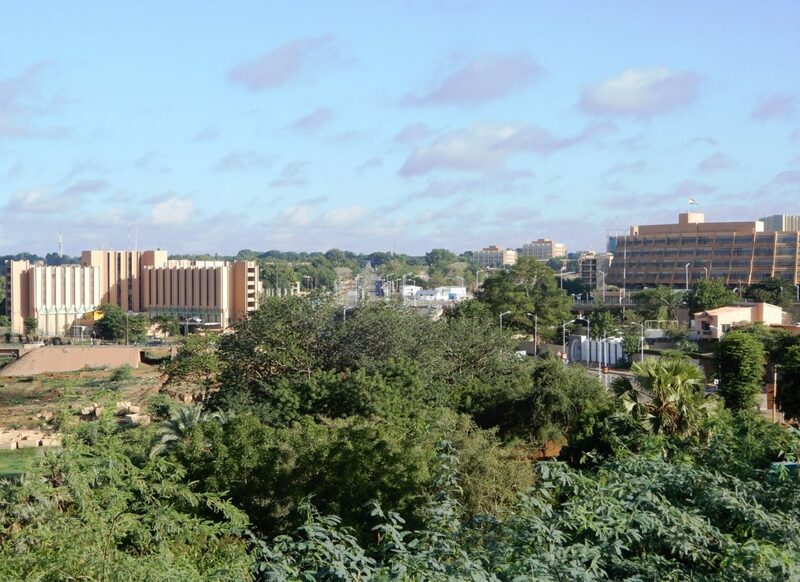 Some buildings are characteristic of Niamey: the Presidency, the Parliament, the National Museum, the Great Mosque, the Stade Général Seyni Kountché, the Hotel Gaweye and the Palais des Congress, some of the Ministries and, in particular, the Ministry of Mines. Today, Niamey is an evolving city : new neighbourhoods are developing, major road infrastructure, luxury hotels, as well as the third bridge over the Niger River are being built, and the Diori Hamani International Airport is under total renovation. 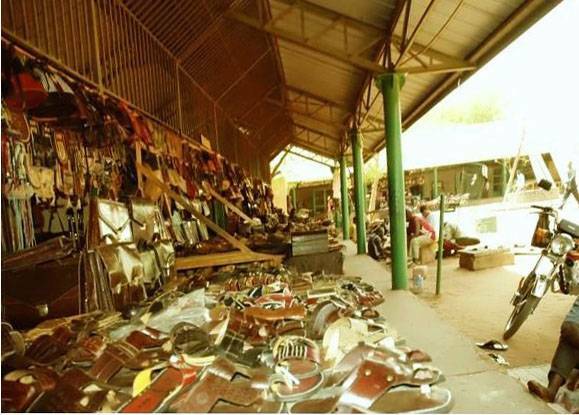 Niamey has many markets. 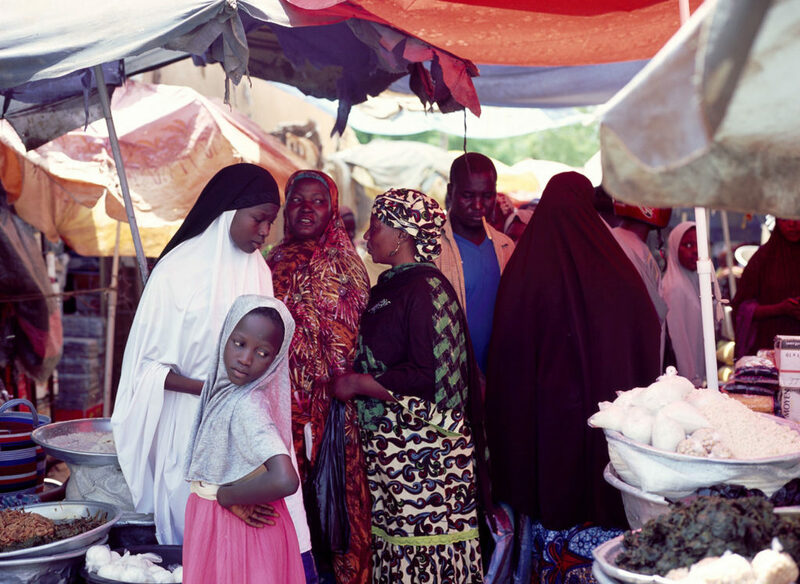 One of the West Africa’s best and most diverse is the Grand Marché, howewer the Albarka Market, the Yantala Market or the Nouveau Marché and the Wadata Market could also be mentioned. Next to the Wadata Market is the Wadata Artisanal Village which, like the Musée National, maintains a good exhibition of national art and craft. Located 60 km South-east of Niamey, the Kouré area offers the opportunity to observe the last species of giraffes from West Africa (Giraffa camelopardalis peralta). Conservation efforts since the 1990s have led to a sizable growth in population and a reintroduction programme to the Gadabeji Reserve in central Niger (designated in 2017 as a Biosphere Reserve by UNESCO), being carried out for an initial group of 10 giraffes. 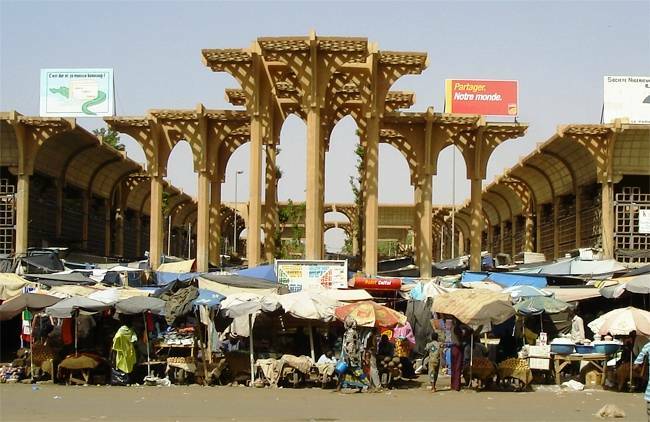 The “Grand Marché” de Niamey was built in 1950. It is a very important market for the supply of Niamey and the local economy. A fire destroyed the market in 1982 and was reopened in 1987. More recently, in 2009, the market was again partially destroyed by a fire. The Wadata Artisanal Village is a cooperative created in 1992 bringing together leatherworkers. The aim is to develop the skills of artisans and improve the quality of products. The Niger River is “the” West African river with a total length of about 4200 km. Even if only about 550 km is in Niger, the Niger River plays a crucial role in the development of the country. The river is simultaneously a source of water for men and animals, for irrigated agriculture including rice fields and vegetable gardens; and for fishery. It’s a corridor of development, communication and exchange. The Niger River is also the habitat to a very diverse wildlife. Apart from its administrative role as capital of the Region of Tillabéri, Tillabéri is a fairly active commercial centre in the western Niger with a large market on the Niger River. It is also a centre for the road transport of people and goods. Ayorou is a small market town on the Niger River. Located on the border of Niger, Mali and Burkina Faso, it enjoys a dynamic cross-border activity. It is a meeting place of different cultures easily identifiable by their clothing. Niger has recorded about 350 hippos, but they are threatened by the difficult cohabitation with the local population, who fear, destruction of their fields and accidents on the river. The government is developing a protected area with a three-fold mission: to preserve hippopotamuses, facilitate scientific research and reduce tensions in cohabitation with locals. 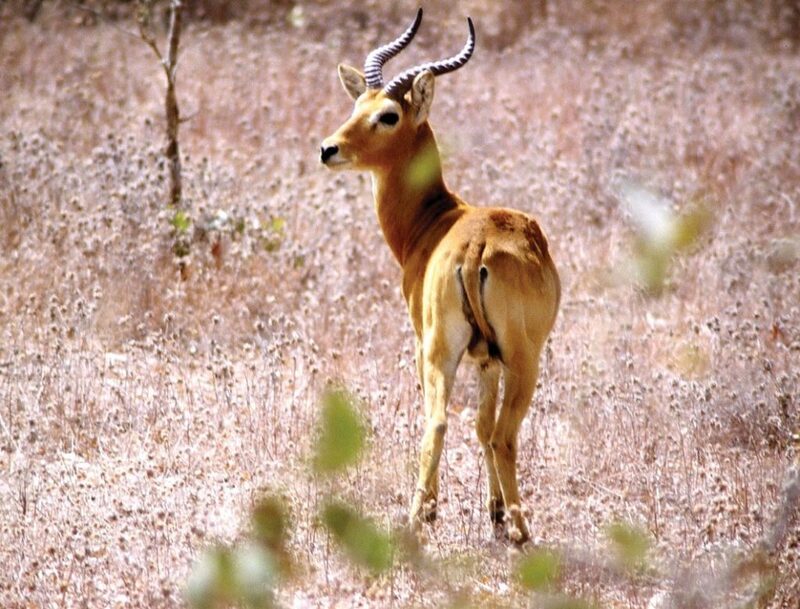 The W National Park of Niger is part of a cross-border complex covering nearly one million hectares jointly managed by Benin, Niger and Burkina Faso and protected since 2007 by the Ramsar Convention. It has been on the UNESCO World Heritage List since 1996. The Savana Lodge, also located on the river. The location of Tillabéri on National 1 makes it an active center for the transport of people and goods to Niamey and further south and east, as well as to Mali through Ayourou. Fishermen on their pirogues. The Niger River is an important source of fish and income for the communities along the river. View of the Niger River at sunset from the Grand Hotel du Niger in Niamey. Rice production in Niger is estimated at a little more than 80 000 tones, of which 85% comes from hydro-agricultural schemes. Here, the rice fields south of Niamey on the Niger River. The park owes its name to the W shape of the meanders of the Niger River in these places. It’s located about 150 km south of Niamey. The W National Park is known for its large mammals, such as aardvark, baboons, buffaloes, caracals, cheetahs, hippopotamus, leopards, lions, warthogs and some of the last wild elephants in West Africa. Northern Niger is to a large extent a part of the Sahara Desert. Despite this, northern Niger presents a great range of diversity and contrast both in terms of population and culture, landscape and resources, as well as fauna and the flora. 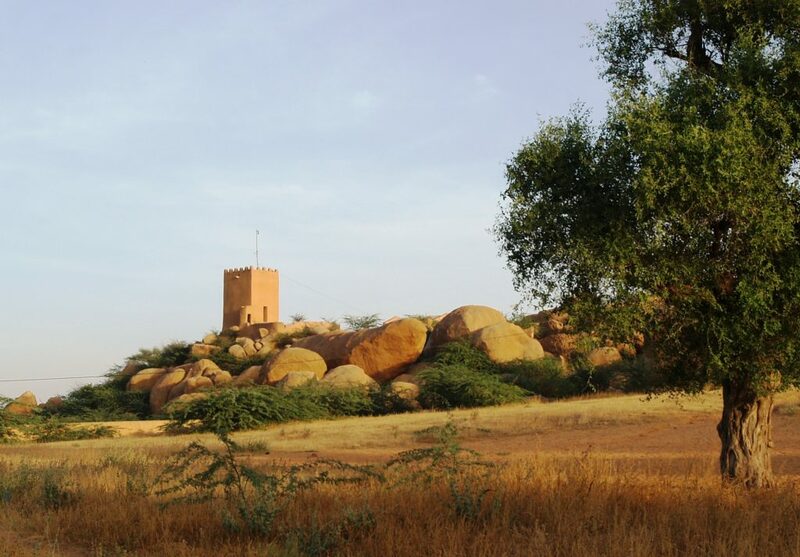 North Niger is also known for the large number of sites of cultural interest belonging to a distant past: (Paleolithic and Neolithic lithic sites and rock inscriptions sites); as well as a more recent past: (pre-Islamic funerary monuments, ancient mosques, ruins of medieval cities, etc.) and it’s also one of the largest uranium mining regions on Earth. To the west, the semi-desert plains of Azawagh, sparsely populated and used for nomadic livestock activities by Tuareg and Fulani. 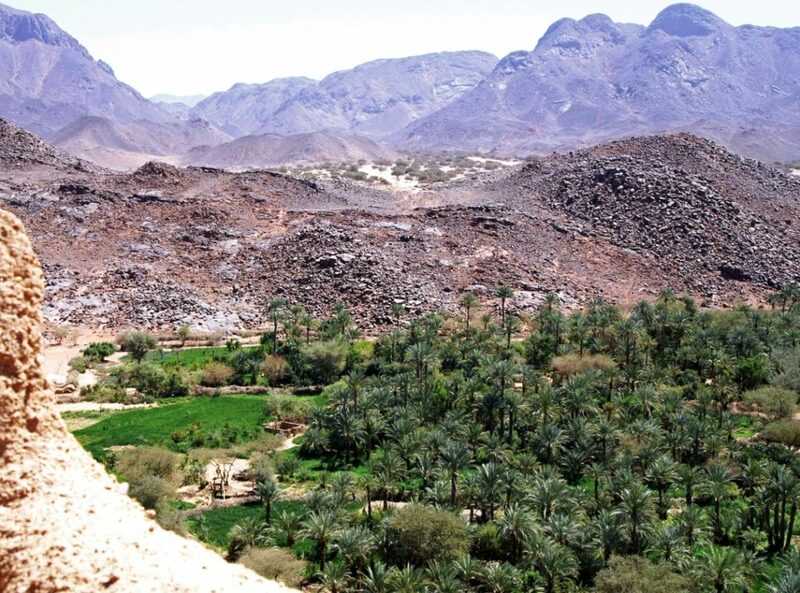 In the centre, 400 km from north to south and up to 200 km wide, the Aïr Mountains with a more favourable climate and where the local inhabitants live off agricultural activities, livestock and trade. 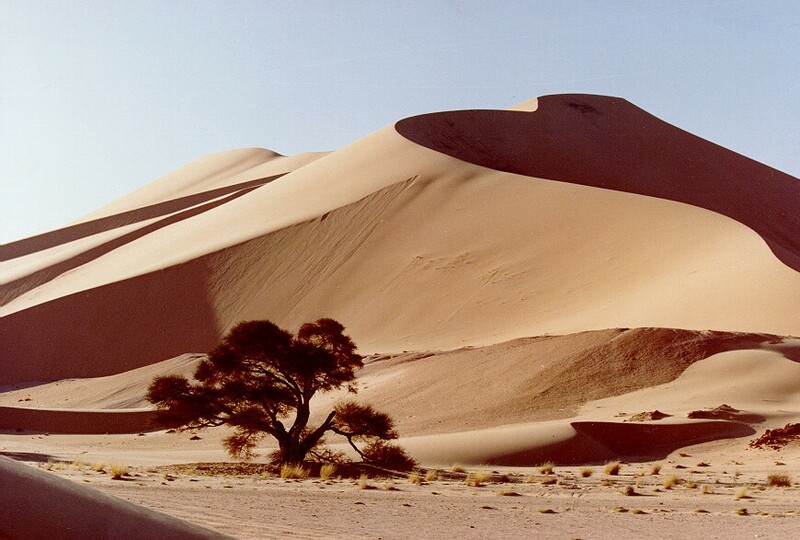 To the east, the desert of Ténéré and the plateaus of Djado constitute a desert environment where the very small population survives in the oases of Kawar and Fachi by the extraction of salt, the exploitation of the palm groves and the exchanges with caravans from the Aïr. The most important city in northern Niger is located in the southern part of the Air Mountains. 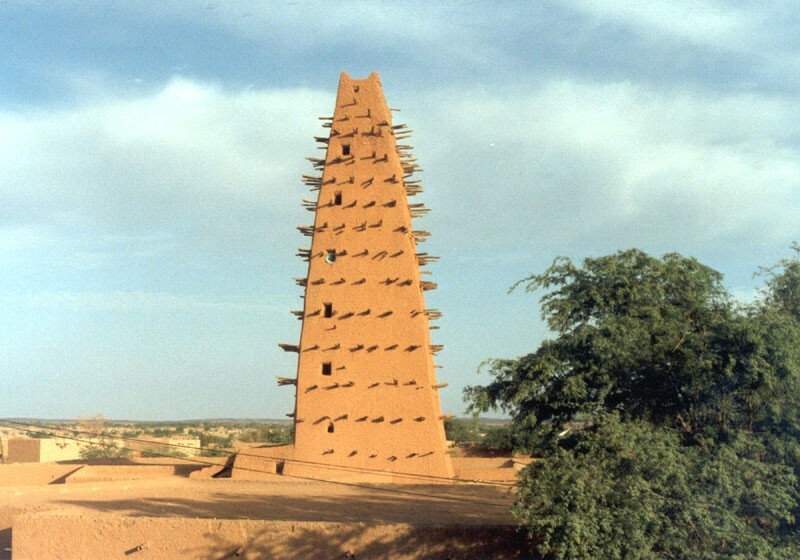 It’s the historic city of Agadez, founded in the eleventh century. For centuries, Agadez was an important marketplace for the caravans crossing the Sahara Desert. Since the sixteenth century, the Sultanate of Air has settled in Agadez. Agadez was added to the UNESCO World Heritage List in 2013. The “Cure Salée”: mid – September, Touareg, Fulani and other pastoralists gather in In-Gall, on the rich prairies of the Aïr. 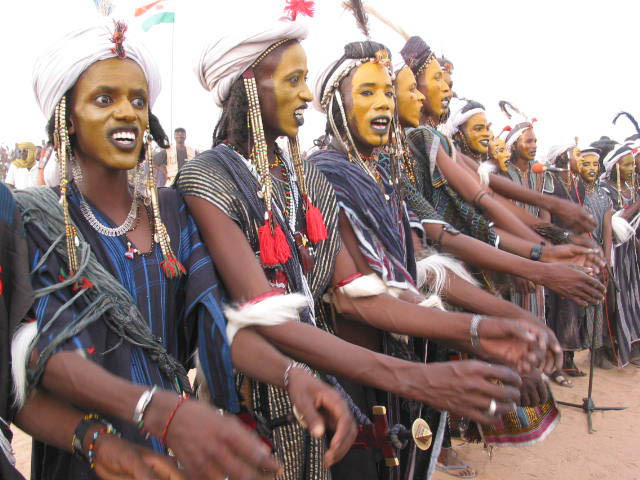 Several festivals as the “Aïr Festival” in Iférouane or the Bianou Festival in Agadez. 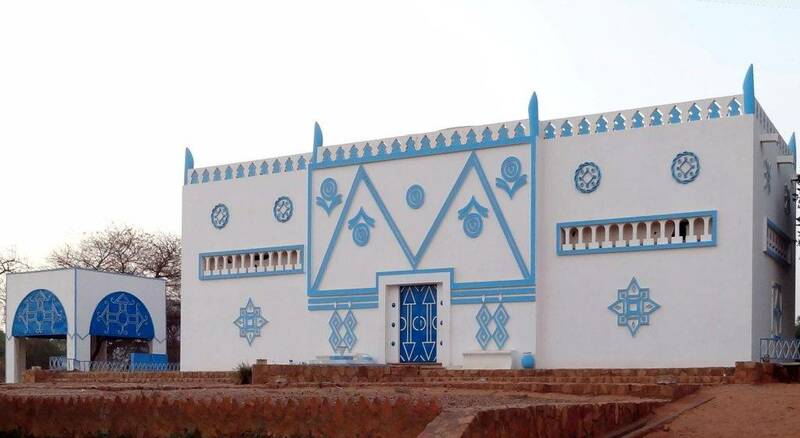 The Great Mosque of Agadez was probably built in 1515. It includes today a 27 m high minaret made entirely of mud brick, the highest structure of its kind in the world. Apart from the inhabitants of Niamey and the Niger Valley, most of Niger’s population lives on a strip of land up to 150 km wide along the southern border of the country. The rural population’s main activity is rain-fed subsistence crop production such as millet, sorghum, and cassava. 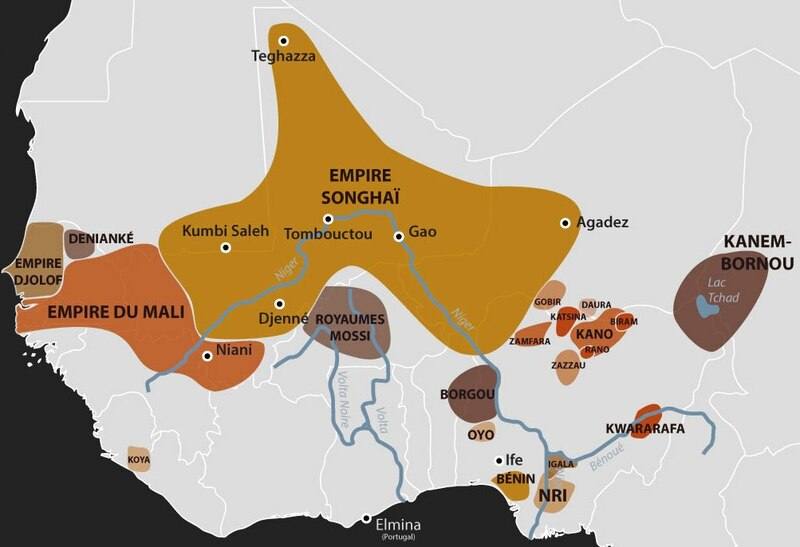 The southern Niger is also characterized by major historic cities being important trade, as well as power centres, such as Dosso, Tahoua, Maradi, Zinder, etc. Dosso is a city in the south-west corner of Niger. 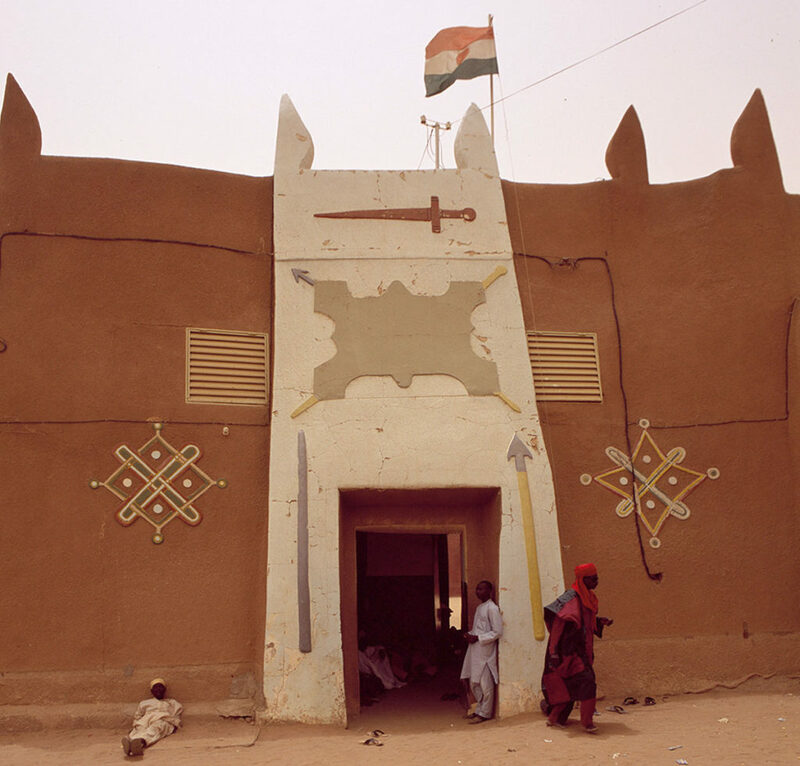 Dosso is the seat of the Dosso kingdom, a Djerma chieftaincy in pre-colonial Niger. The traditional ruler is called Djermakoy. Attractions in the town include the Djermakoy’s Palace and museum. Situated on the boundary between the cultivated zone and the drier, pastoral zone, it is an important trading centre where pastoralists and farmers meet at the junction on the road between Agadez and Niamey. Maradi is a dynamic merchant city, on the route north from Kano in Nigeria. 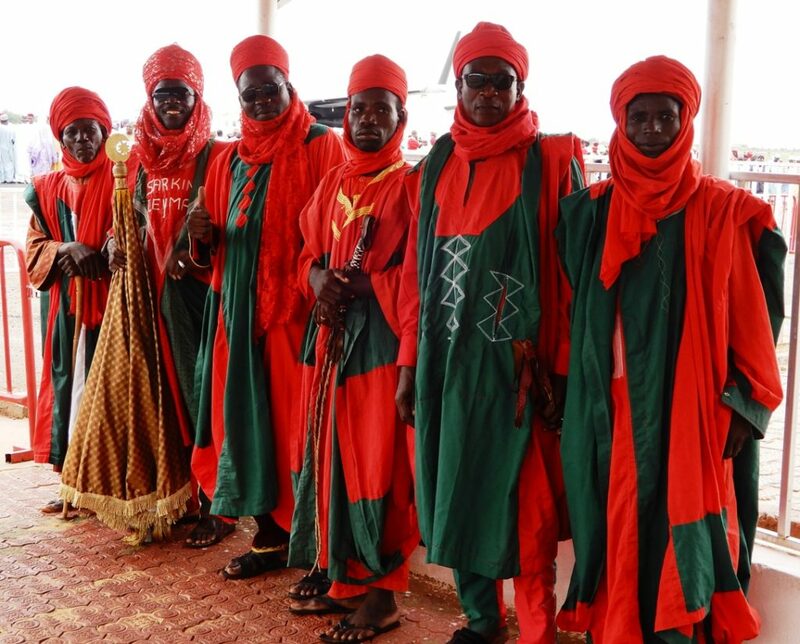 The predominant population in the city is Hausa, with a few urbanized Fulani and Tuareg. It was originally part of the Hausa State of Katsina that collapsed in the early 19th century during the conquests of Ousman Dan Fodio. In 1807, Maradi became the seat of the Katsina-Maradi Sultanate. Zinder rose from a small Hausa village to become an important centre with the founding of the Sultanate of Damagaram in 1736 by Kanouri aristocrats. The large fortress in the southeast central city (Birni) was built shortly thereafter. Zinder became a major hub of the trans-Saharan trade and the trade south through Kano and east to Bornu. The French took Zinder in July 1899, and Zinder served as the capital of the Niger Military Territory from 1911 until 1926 when the capital was transferred to the village of Niamey on the Niger River. Diffa is the regional capital of the Diffa Region in the far southeast of Niger. The economy of the Diffa Region is primarily based upon pastoralism and farming. Apart from the subsistence crops, the seasonal Komadougou-Yobe river, which forms around 150 km of the border with Nigeria allows farmers to grow rice, maize, red pepper etc. The French Captain Marius Gabriel Cazemajou was killed in Zinder in 1897 and afterwards, Zinder was occupied by the French in July 1899. They established a fort called Fort Cazemajou. Upon Niger’s gaining of independence the fort was renamed Fort Tanimoun (Sultan of Damagaram). Pastoral well in eastern Niger (Diffa region). Nomads and their livestock are dependent on access to water for watering livestock. Pastoral livestock farming has a key economic role in Niger. This activity contributes to ensuring food security for rural and urban households. Nevertheless, pastoral systems face many challenges. If there is one area that makes Niger proud at national and international levels, it is the craft sector. Witnessing the diversity of the peoples of Niger, the craft industry carries the memory of nomadic and sedentary traditions. Everywhere in Niger, every ethnic group, every region has proudly developed its expertise in its specialties. The range of products is vast and initially corresponds to the needs of the populations and traditional chiefdoms. Each of the many peoples of Niger is identifiable by their clothing and the style of their personal belongings that accompany them throughout their lives. This diversity is the result of the know-how of Niger artisans throughout the country. Djerma weavers are known for their talent in making cotton wedding blankets and true tapestries accompany the woman throughout her life. Hausa embroiderers have an unparalleled reputation. As well as Fulani weavers, they also create canvases with monochrome geometric patterns or makes colourful clothes embroidered on indigo fabric. For centuries, Nigerien craftsmen have been fashioning useful objects ranging from traditional weapons to fine silver and gold jewellery. Also, tools, locks and other metallic items are fabricated..
Braiding is a traditional technique used to make mats, different sort of utility objects, hats and even mats as cover for huts. The raw material is the tagait (doum palm leaf). It is transformed, cooked and coloured by the craftsmen themselves. Many other objects mark Nigerien craft traditions: talc stone sculptures, red clay pottery, wooden objects, drums and other musical instruments. The weavers were nomadic weavers, working during the dry season and farming during the rainy season. They travelled from family to family to weave at the request of the family. 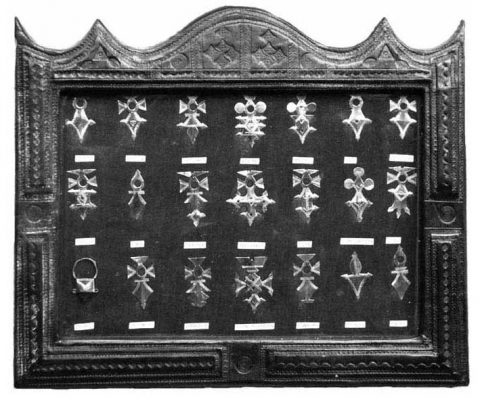 There are 21 different desgns of Agadez crosses, each of them is the symbol of a city. 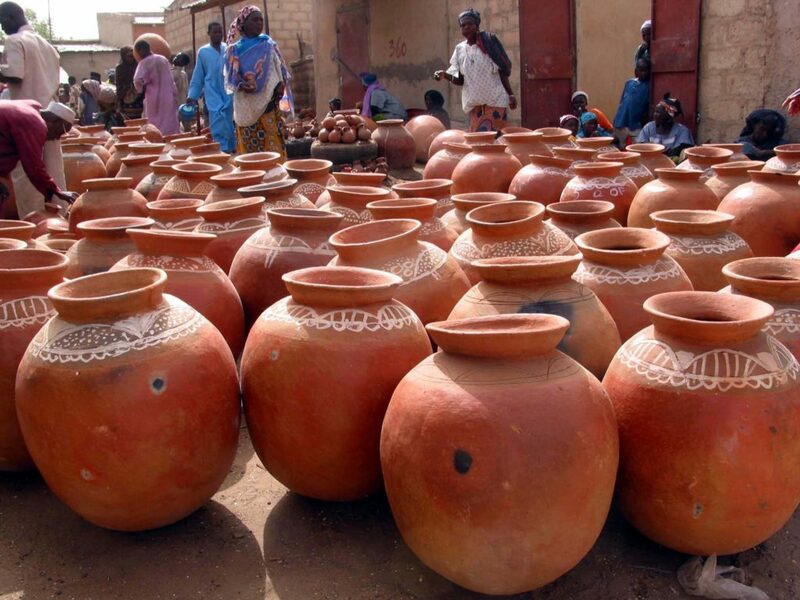 Here “canaris” (huge water jars) at the “Petit Marché” of Niamey. The “canaris” are produced by women at Boubon, about 25 Km north of Niamey. The griot is a repository of the oral tradition and it accompanies of songs and music all important events. Here, the Hausa griot Manzo Maman in 1976 working on finishing a drum. As arts and crafts are an expression of national identity in Niger, each city has established an art and craft cooperative or centre to support and develop this activity. Here the "Cooperative du Village Artisanal" in Zinder.